In a kadai put twp teaspoons of oil and fry red chillies, coriander seeds, bengal gram dhal, urad dhal, cinnamon stick and cloves separately. Finally add the coconut gratings and fry well. Cool it. Add salt and grind it to a powder. Take one cup rice and wash and dry it. Then take kadai add 2tbsp ghee and fry rice. Add 11/2 cup waterand add little salt cook rice till soft. Chop the onion finely. 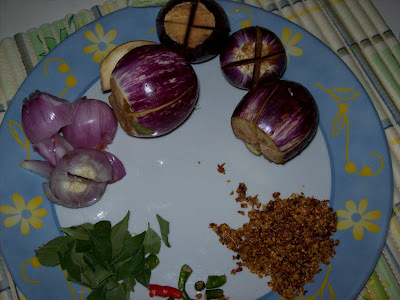 Cut brinjal into lengthwise thin slices. In a kadai put the oil and when it is hot add mustard. When it pops up, add bengal gram dhal and urad dhal and fry till it turns light brown. Add chopped onion and fry well. Add brinjal along with turmeric powder and salt and stir fry till the brinjal is soft. Add ground vangi bath powder and stir well. Then add cooked rice and mix well. Add lemon juice and once again stir well. Garnish with coriander leaves , and serve with salad, fried papad or chips. coconut and cariander leaves (ground). 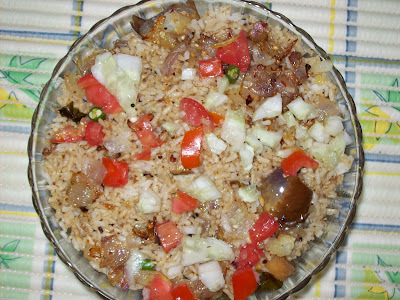 Soak rice in water for 10 minutes.Wash the brinjals and cut into long pieces. Apply salt and keep aside.Heat oil in a pan fry brinjal pieces. Again heat oil in a heavy bottomed pan. Add onions, chopped garlic, lavang, cardamom, green chillies and bay leaves.Stir. Add ground masala paste, powdered masala and tomato pulp and salt to taste. Now add rice and mix well. Add 5 cups of water to the rice and bring it to a boil. Add a little lime juice and cover the pan.